fabric and topped with ribbon and fabric roses and a fabric bow. Gifts for any occasions, including birthdays, weddings, new baby, christenings, anniversaries, graduation, thank-you presents, Christmas, Bar and Bat Mitzvah, Valentine, Mother's Day, condolence, bereavement, Get Well Soon, housewarming, staff incentives, raffles, retirements, long service awards etc. 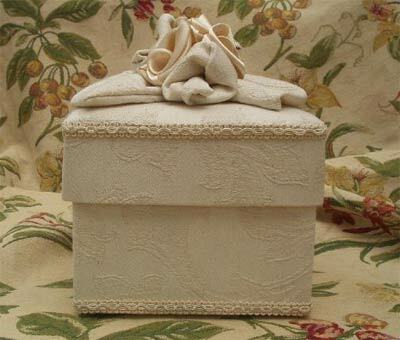 Storage of hats: boxes are available large enough in which to store precious hats. Time capsules to capture the memories of a special day or event, such as a wedding, or the birth of a new baby. Wedding presents which can be personalized with initials and dates. 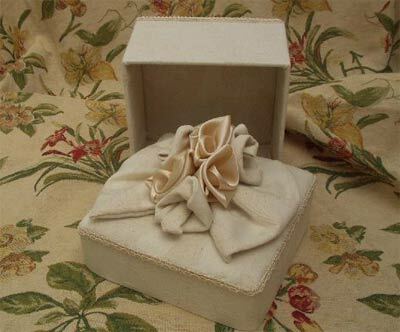 Wedding mementoes to be given to special guests (such as mothers, mothers-in law etc. ), bridesmaids and attendants. They can be produced to complement the wedding colours and bridal dress fabric. Part of shop displays to enhance a product. Space saving storage solutions. use the boxes for storing: jewellery, make-up, perfumes, toiletries, hair or nail accessories, keepsakes, stationary, greetings cards, chocolates, lingerie, linen, wedding dresses, CDs/DVDs/videos, cassette tapes, books/magazines, bottle of champagne, sewing items, reading glasses, human or pet ashes. Stacked boxes are available to give even more storage capacity.